If jewelry is the focal point of your retail store, then display your inventory in the most elegant way using our metal framed jewelry display case with maple finish. It&#39;s a modern classic that will give you years of affordable elegance and dependability for your jewelry store. Our case offers a wide variety of features including a durable melamine laminate maple finish with tempered glass top, front and sides. Additional features include mirrored sliding rear doors with lock, and concealed rear storage area and white sliding rear doors, to make showcasing and restocking easy on the jeweler. An optional lock for rear storage area and light kit available and sold separately. Crating for secure shipping is included in the price of the case. 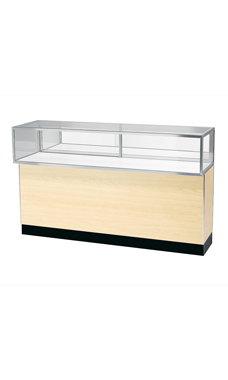 The jewelry case display area measures 12"H x 20"D, while the base measures 26"H x 16"D. Overall size: 38"H x 20"D x 70"L. Available for immediate shipment.